Vibratech TVD’s expert concentration is OEM damper design & development for the powertrains that move the global economy. From conception through production, we provide personal attention and flexibility to efficiently assist engineering teams exceed their goals. 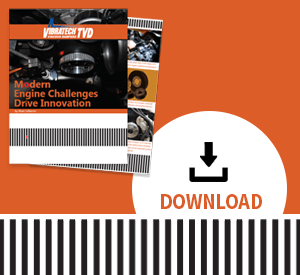 For the past 70 years, Vibratech TVD viscous dampers have been the commercially proven method to deliver reliable powertrain durability. Built into every Vibratech TVD torsional viscous damper is expert torsional vibration analysis, design integration, engineering and demanding product validation. The viscous damper has evolved from crankshaft applications to include camshafts, drivelines and hybrid or full electric drives. To assist in overall cost reductions, Vibratech TVD engineering and precision CNC machining can provide for the integration of pulleys, gears and timing wheels into the outer housing of the damper. Global manufacturer of off-highway equipment on verge of loosing customer because of major torsional vibration problems originating from elastomeric damper failing during operating duty. 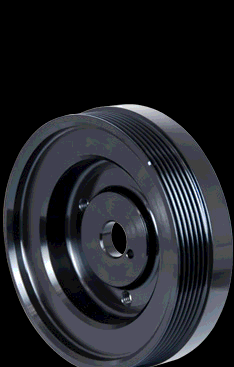 Manufacturer sought viscous damper solution from Vibratech TVD for improved durability and reliability. Vibratech TVD was able to analyze, engineer and manufacture a solution within a matter of weeks, thus helping to save the customer for the manufacturer. Impressed with the benefits and understanding the limits of retrofitting, the same manufacturer then contracted with Vibratech TVD to develop viscous dampers in conjunction with their Tier 4 engine development. Vibratech TVD contracted by major manufacturer of military vehicles to develop and manufacture viscous damper as an upgrade from elastomeric damper causing potential engine failures during field operations. Newly developed diesel engine equipped with Vibratech TVD torsional viscous damper successfully passed NATO validation testing. Vibratech TVD solicited to participate in engineering exercise to reducing weight, cost and increase longevity of damper currently used on major global over-the-road engine and vehicle manufacturer. Light aircraft engine manufacturer sought Vibratech TVD to improve durability of current starter shaft viscous damper. Vibratech TVD analyzed design and developed proprietary non-metallic internal bearing. New viscous damper improved quality and successfully passed FAA validation testing. Vibratech TVD was awarded production contract from manufacturer. Broad experience from high performance motorsports to massive gas compression pumping engines. Purpose built tuned viscous dampers for drivelines, PTO shaft accessories and starter shafts. Eliminate hybrid and full-electric drive backlash growl.